Angelina Jolie's kids are becoming bona fide red carpet pros. Although they haven't made many appearances in the past, Jolie has brought them along to several recent events, including the Toronto Film Festival last month. For their latest outing, 11-year-old Shiloh and 12-year-old Zahara joined Mom on the red carpet for the premiere of The Breadwinner in Los Angeles, and they looked so cute in their outfits. 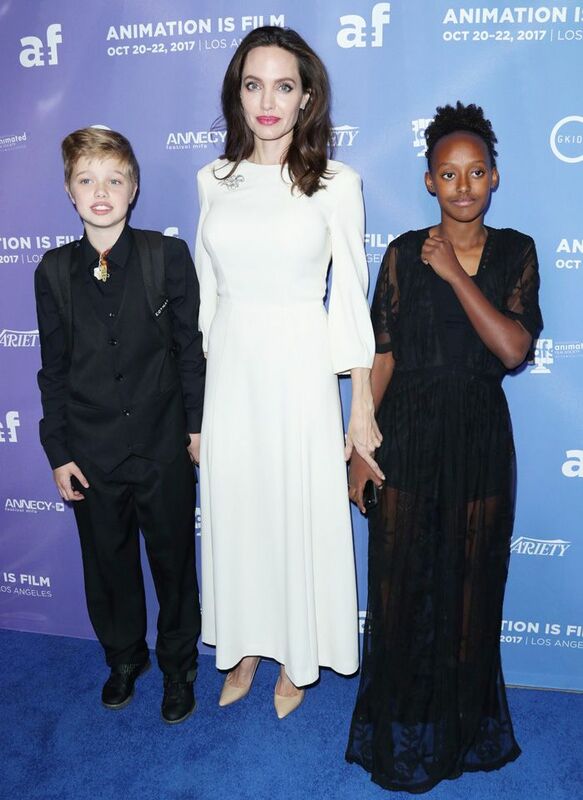 Clearly taking style cues from Jolie's signature look, both of the girls wore all-black outfits, with Shiloh opting for a suit and Zahara going for a pretty gown with sheer sleeves. Have you ever seen a chicer trio? Scroll down to see Angelina Jolie with her kids on the red carpet. Next up, supermodel Bar Refaeli just gave her new baby the most fashion-girl name.